I’ve attempted to watch rockets launch from Vandenburg Air Force Base a few times when I was in California, and the thing I remember most about it was just how far away the official viewing areas were. The rocket is a tiny spike in the distance, and it’s like that for many valid safety reasons. 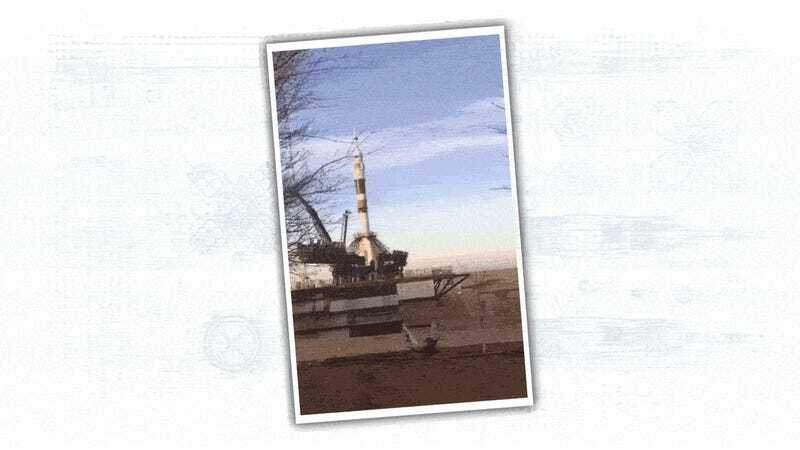 At the Baikonur Cosmodrome in Kazakhastan, safety is more about suggestions than hard rules, so amazing things like seeing a Soyuz rocket launch from very, very close are possible. Scary, loud, hot, maybe dangerous, sure, but also amazing. That had to be insanely loud, and very likely hot, as I’m pretty sure you’d feel a blast of heat from the exhaust even at that distance. Just to get a sense of where this likely is, I looked at a satellite image of the launchpad, known as Gagarin’s Start, since that was the launchpad that Yuri Gagarin blasted off from to become the first human in space back in 1961, and still used for crewed Soyuz launches to this day. Based on what we can see from the video and reference pictures from the ground, I think this was shot from somewhere near where I point out there, just outside of the big exhaust trench. That little lens-flare/reflection in the video seems to be some sort of optical effect from the engines of the Soyuz rocket, though I have no idea how the optics work to do that. But the pattern is the exact same, and I don’t think it’s a coincidence. Anyone have any idea about how this works? I know it’s likely not the best idea, but I’d love to see a launch like this, from that close. But I think I’ll bring earplugs and maybe wear a hat.